VALBREMBO, Italy – On 29th November 2017, N&W Global Vending S.p.A. announced the change of company name. 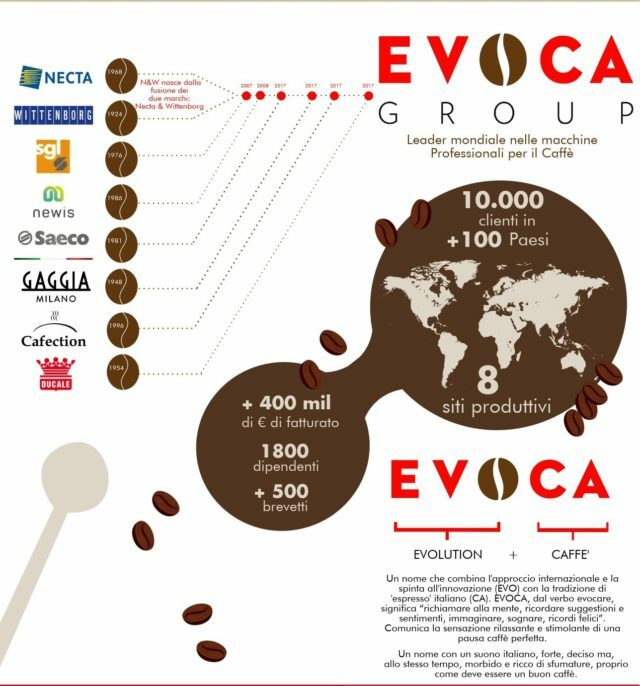 Evoca S.p.A. brought together under one roof many brands, all of them united by a clear and ambitious aim – to consolidate their strategic positions in the coffee sector by developing innovative, cutting-edge technologies. In its first year, Evoca, by working with great commitment and perseverance, has confirmed its global leadership in the field of professional coffee machines. The Group has sales subsidiaries and representative offices in 17 countries, a network of agencies and dealers in over 140 countries worldwide and a share of turnover dedicated to exports, which in 2017 reached 76%. In February, the Group acquired Vendors Exchange Global Solutions, LLC (“VEGS”). Subsequently, Evoca Group received a special mention for internationalization in the field of “Corporate Excellence” promoted by GEA, Harvard Business Review and ARCA; recognising its determination to continue its global expansion. In May, to strengthen its position in the Ho.Re.Ca. market, Evoca Group acquired Quality Espresso S.A.. This move significantly expanded its existing range of manual espresso machines while leveraging QE’s expertise. It also supported the development of innovative technologies, such as telemetry, currently offered for QE ranges of manual machines. Speaking of ‘innovative technologies’, Evoca Group celebrated the 80th anniversary of Gaggia Milano by announcing a brand relaunch by means of a comprehensive new range of professional machines that combines the powerful heritage of Gaggia Milano with the innovative technology incumbent in Evoca Group’s expertise. With 600 registered patents, 6 R&D centres that design and manufacture machines and products dedicated to each brand in the Vending, OCS and Horeca sectors, not forgetting 150 people dedicated to the development of new projects, ‘innovation’ is one of the main characteristics that distinguishes the Group. This was demonstrated time and again during the year as Evoca was prominent at the world’s most important trade fairs and events introducing a plethora of new products. From telemetry solutions and smart payment, to machines designed and built to guarantee a consistently exceptional coffee consumption experience, Evoca Group led the market, with each of its brands delivering leading edge products designed to set new benchmarks in the sectors for which they were developed. During this year, Evoca’s commitment to innovation was also reflected in production, thanks to the Future Factory concept. The Digital Lean Factory project has delivered in full on all the objectives set out in the 2016-2018 three-year improvement plan: to minimize waste until it is eliminated and to aim for operational excellence. Having a digitized, lean and efficient factory allows us to respond to the changes required by the market, giving us a vital competitive edge. The Group expects to continue its expansion in markets across the world. Our immediate focus is on the emerging Asian markets where, thanks to continuous growth in coffee consumption, Evoca is committed to becoming the leading Office Coffee company in the sector. Another region that interests Evoca is the United States, where espresso-based drinks are replacing filter coffee-based drinks, thus offering new business opportunities.